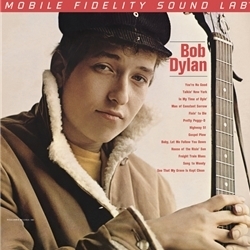 Bob Dylan’s self-titled 1962 debut is as understated of an entrance as any significant musician as ever made.Already well-versed in American roots music, Dylan simultaneously pays homage to tradition and extends it by putting his own stamp on classic material that metaphorically functions as the soil of our contemporary songs and styles. Free of ego, and performed with masterful conviction, Bob Dylan ranks with the debut efforts of similar artistic giants Elvis Presley and theRolling Stones. Mastered on Mobile Fidelity’s world-renowned mastering system and pressed at RTI, this restored 180g 45RPM 2LP analog version brings the contents of this seminal release as closest as they’ve ever come to master tape-quality.Transparent to the source, the simple sounds of Dylan’s voice, acoustic guitar, and harmonica take on lifelike perspective and dimensions—the “husk and bark” to which Robert Shelton referred in his now-legendary New York Timesreview of a Dylan appearance at Gerde’s Folk City. MoFi has made possible an inexpensive time-traveling trip back to the Greenwich Village coffeehouses and folk clubs in which Dylan cut his teeth, albeit in much better fidelity and without any annoying background noise. Wider grooves mean more information reaches your ears.